Morocco stressed the need for stepping up and adapting the efforts of the global coalition for a joint action to defeat ISIS. Speaking to the press after the Regional Meeting of Political Directors of the Global Coalition to Defeat ISIS, hosted in Skhirate (Rabat’s suburbs) Tuesday, Morocco’s Foreign Minister pointed to the scale of the terrorist threat in the continent which continues to hamper stability and development. In 2017, 343 terrorist attacks took place in the continent killing at least 2600 victims, 22 times more than the number of victims falling to terrorism in Europe, Nasser Bourita said. He said Al Qaida is the largest terrorist group in Africa with about 6000 fighters, of whom 3500 operate in West Africa. In his address before the meeting, the Foreign Minister said Morocco attaches utmost importance to the security and stability of Africa as part of the Royal vision permeated by south-south cooperation with African states. He called on the Global Coalition to step up efforts to help African states face the terrorism scourge, saying the current meeting of the Global Coalition to Defeat ISIS is a chance to discuss next steps to achieve a lasting defeat of ISIS in Iraq and Syria and curb the terrorist group’s global ambitions. The effectiveness of the fight against terrorism in Africa “requires adequate consideration of the root causes of this scourge (…) without which our action will remain in vain”, he noted. He explained in this connection that the vulnerabilities linked to the impact of climate change on African populations, the impoverishment of entire communities due to the absence of inclusive economic growth, aggravated by a galloping demography, constitute fertile ground for the infiltration and subsequent uprooting of terrorist groups and their extremist ideologies. Also, “the absence of cooperation that is equal to the growing evolution of these challenges, combined with the inconsistency of certain approaches adopted, expose African States to multiform pressures,” the minister noted. Africa “needs more than ever a common, immediate and determined action to promote its political stabilization, strengthen its security and support its economic development to enable it to regain its primary vocation, namely that of a real platform of attraction and a space of development and stability”, he pointed out. 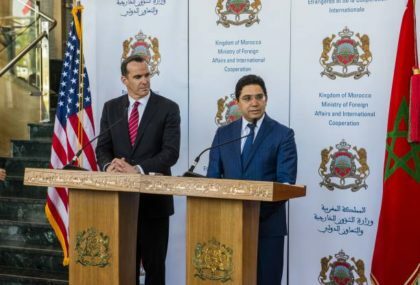 President Trump’s Special Envoy for the Coalition to Defeat ISIS, Brett McGurk, who took part in the Skhirate meeting pointed out that Morocco has played a “decisive” role at the forefront of global efforts to fight terrorism. The US official expressed thanks to Morocco for the efforts it is making, under the leadership of King Mohammed VI, in the fight against the hateful ideology of ISIS and other terrorist groups. He recalled that the Kingdom had set up a field medico-surgical hospital in Jordan that provides care to thousands of Syrian refugees and that it co-chairs the Global Counterterrorism Forum (GCTF).